The panels within a projector are key components in determining the resolution, clarity and contrast of the final image. Three types of panels dominate the industry: LCD, DLP and LCOS. LCD and DLP are the most common, but each has its drawbacks whilst LCos is a hybrid of the two. The following guide is a brief overview of the technologies and how they differ..
DLP is a technology developed by Texas Instruments. DLP has a long history of projection innovations starting with their first mainstream projector introduced in 1996 to the industry's first ultra short throw, lamp free, 1080p projector introduced in 2014. 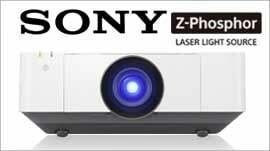 DLP technology can be found in projectors from Manufacturers such as BenQ, InFocus and Optoma. When combined with a light source and a projection lens, each mirror on a DLP chip can tilt either toward the light source or away from it, making the pixel become white or black. The DLP chip can have up to two million microscopic mirrors, each measuring less than one-fifth the width of a human hair and corresponds to one pixel on the final projected image. A spinning colour wheel made up of coloured segments is placed between the light source and DMD chip. The mirrors are then turned on and off perfectly in time with the right colour - this allows us to display a total of 16.7 million different colours creating a fantastically vibrant, life-like picture. Pros and cons of DLP. Sealed optics so image unaffected by dust unlike 3LCD. Smaller chassis than 3LCD rivals. Generally more affordable than 3LCD projectors. The 'rainbow' effect, appearing as a momentary flash of rainbow-like striping typically trailing the bright objects when looking from one side of the screen to the other, or when looking away from the projected image to an offscreen object. Only some people see this effect. Not as colour accurate as 3LCD rivals. 3LCD is the world’s leading projection technology that delivers bright and natural colour, amazing detail and proven reliability. 3LCD was pioneered by Epson in the 1980s and is marketed by an affiliated organisation known by the same name: "3LCD ". The technology has been licensed for use by other manufacturers worldwide for the ultimate viewing experience in projectors. 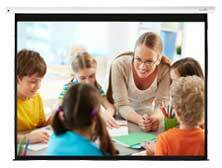 LCD technology can be found in projectors from Manufacturers such as Epson, Hitachi and NEC. 1.Creating Colours from White Light - A 3-chip Liquid Crystal Display (3LCD) projector works by first splitting the white light from the lamp into its three primary colours of red, green and blue by passing it through special dichroic filter / mirror assemblies called “dichroic mirrors.” Each dichroic mirror only allows specific coloured wavelengths of light to pass through while reflecting the rest away. In this way, the white light is split into its three primary colour beams and each is directed toward its own LCD panel. 2.Image Generation at the LCDs - The three LCDs are the elements that receive the electronic signals to create the image which is to be projected (hence the technology’s name, “3LCD”). Each pixel on an LCD is covered by liquid crystals. By changing the electrical charge given to the liquid crystals, each pixel on an LCD can be darkened, lightened or shaded. In this way, the brightness level on every pixel for each primary color can be very precisely controlled to produce the final pixel's specific colour and brightness level required on the screen. Thanks to this ability to display a smooth range of brightness levels, the LCD panels of a 3LCD projector can generate very smooth image gradations. 3.Colour Image Recombination and Projection - After each coloured light is filtered through its individual LCD panel, the beams are recombined in a dichroic prism that forms the final image which is then reflected out toward the lens. This results in images with rich and full colour, since all three basic colours are included in each pixel of the projected image at all times. Pros and cons of 3LCD. Brighter colours, smoother gradations and colour accuracy than 1 chip DLP rivals. No rainbow effect unlike 1 chip DLP. Liquid Crystal on Silicon or LCOS as it's more commonly referred to is a hybrid of DLP and 3LCD which in it's simplest form brings the benefits of high contrast and clarity of DLP and combines with the colour accuracy of 3LCD. Free from the ‘lattice’ and ‘rainbow’ effects that mar the images produced by LCD and DLP projectors, LCOS can reproduce exceptionally fine images, retaining crisp detail for small text, CAD drawings and technical data. The projector incorporates three LCOS panels, one each for red, green and blue. In each panel, a layer of liquid crystal pixels is applied over a reflective mirror substrate, with the drive circuitry placed underneath. This combination of transmissive and reflective technologies takes the best aspects of LCD and DLP projection, while eliminating the drawbacks. LCOS can be found in Canon XEED projector models. Sony have their own version of LCOS namely SXRD. Pros and cons of LCOS Technology. Excellent colour and grayscale reproduction. Higher cost than DLP and LCD projectors. We hope the above display technology guide has given you a clear understanding of the basics in what to look out for. We understand there is a lot to take in and a lot of choice so if you still need help we're only a phone call or email away.